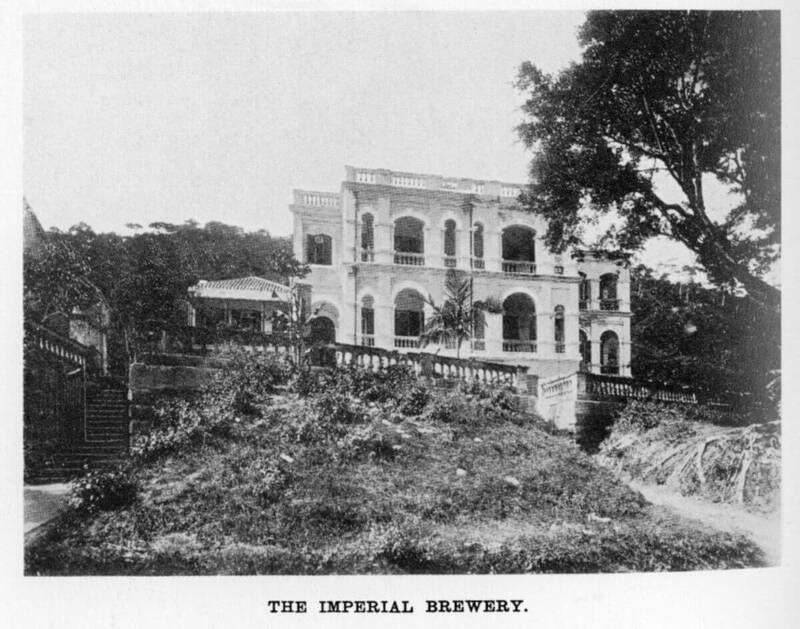 HF with thanks to IDJ for the image: “An industry only recently, started in Hongkong is that carried on — under the general management of Messrs. Barretto & Co. — by the Imperial Brewing Company, Ltd., which was formed in 1905, and commenced operations in December, 1907, as soon as the necessary plant had been erected. The premises are situated in the Wongneichung Road, and the equipment, imported from America by Mr. F. J. Berry, the present works manager, and erected under his supervision, is thoroughly up to date, and makes possible the latest scientific methods. The brewing master is Mr. A. F. Weiss, a graduate of the U.S.A. Brewery Academy, under whom are employed about sixty men. The brew is brought to a boil for two or three hours, according to the brand of beer required, and is then ready for discharging into a “hop jack.” This is fitted with a false bottom, and the clear beer is then pumped on to a surface cooler, where it remains for an hour or two. It is then run over a Baudlet cooler, and, while at a temperature of 36° F., yeast is introduced. The beer is then aerated from twelve to fifteen hours, when more yeast is added. The froth caused by the fermentation is removed, the skimming being continued until the fermentation ceases, this process lasting from three to eight days, according to the strength required. The beer is matured in tanks for several months, and is then run into chip casks, and re-charged with kreausen*. Twelve or fifteen days later it is ready for filtration and casking or bottling. That intended for bottling is pasteurised to prevent deterioration and give it a palatable fullness. 1905. Is this the”converted house” referred to below? Imperial Brewing seems to have closed after only a year or two, pushed under, perhaps, by a combination of its own poor beers and the arrival of another concern, Oriental Brewery…. This article was first posted on 8th February 2014.